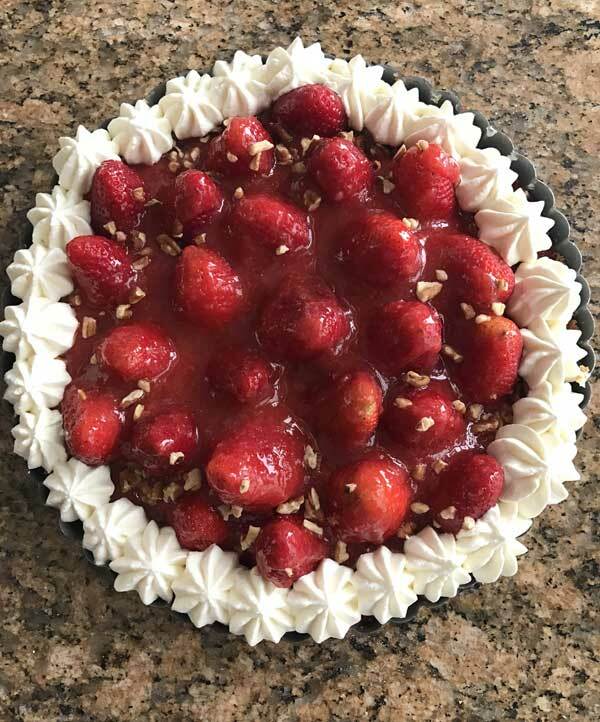 My original plan was to make a strawberry pie, but then it occurred to me that I hadn’t made this strawberry tart in a while, and that I’d never shared the recipe. It’s called Almond Strawberry Tart, but in this case I used pecans, so consider the “almond” part optional. Originally from Cooking Light, it is supposed to be made with light cream cheese, though I usually just use regular. As mentioned, I skipped the almonds, but I did not skip the almond extract because it really makes the flavor more interesting. Of course if you don’t like almond extract, you can always substitute with a little extra vanilla. The only downside to this recipe is it requires a food processor, so plan on making it when you have time to clean out the processor. 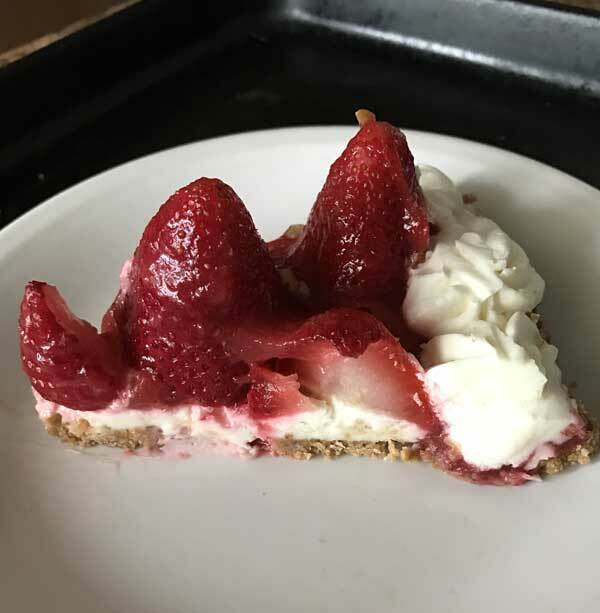 Originally from Cooking Light Magazine, this fresh strawberry tart is perfect for spring. Preheat oven to 350°. Grease or spray a 9 inch removable bottom tart pan. A 9 inch springform pan will also work. Process grahams into fine crumbs. Add the 2 tablespoons sugar, melted butter, and water and pulse to mix, then rress mixture into the bottom and about 3/4 inch up the sides of the prepared pan. Bake at 350° for 10 minutes or until lightly browned. Let cool completely on a wire rack. Filling: Mix together the softened cream cheese, 1/4 cup sugar, and extracts. Spread mixture evenly over bottom of tart shell. Topping: place 1 cup strawberries in food processor; process until pureed. Combine strawberry puree, 1/3 cup sugar, and cornstarch in a small saucepan over medium heat, stirring with a whisk. Bring to a boil, stirring constantly. Reduce heat to low; cook 1 minute. Remove glaze from heat, and let cool to room temperature, stirring occasionally. Toss 4 cups of the best looking, similar-in-size strawberries with lemon juice, then arrange berries, bottoms up, in a circular pattern over filling. Spoon glaze evenly over berries. Sprinkle nuts around edge or sprinkle over the top. Pipe light whipped topping or freshly whipped and sweetened cream around the edges. I have made this tart often over the years since it was published and I really like it as well. That said-I sub graham cracker crumbs and avoid the whole food processor part myself! That seems like it would be really tasty and way fewer calories than the typical strawberry cream cheese dessert. I think I would like the ratio of strawberries to cream cheese better in this too. I think you could avoid the food processor by mashing the strawberries with a potato masher. It would be worth a try if you want s to avoid the food processor.